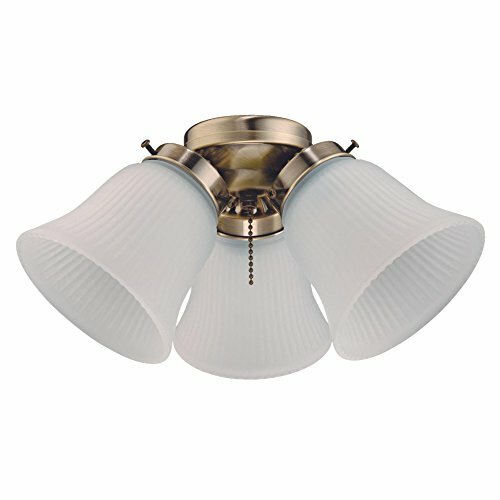 The Westinghouse three-light cluster ceiling Fan light kit includes energy and cost-saving LED light bulbs. They provide long-lasting, performance, bright illumination, and eliminate the need to change bulbs in hard-to-reach fans. With a classic antique brass finish and three frosted ribbed glass shades, this light kit offers traditional style. Add an abundant source of beautiful lighting to any indoor ceiling Fan. Westinghouse is a trusted, global brand. Westinghouse knows lighting and offers products with exceptional quality, reliability and functionality. Product reference number 77848.